Spinner dolphins (Stenella longirostris) are wee cetaceans that are members of the family Delphinidae. Their naming comes from their habit of jumping out of the water and whirling around. Spinner dolphins are social in nature, and it's not uncommon to notice them in units of thousands of individuals. They even spend a lot of time with creatures of other species -- think spotted dolphins. Other common monikers for these dolphins are long-snouted spinner dolphin and spinner porpoise. Spinner dolphins reside in the Pacific, Indian and Atlantic oceans, both in subtropical and tropical settings. Some spinner dolphins inhabit waters as far down south as New Zealand. They live all around the planet, from waters surrounding Japan and Australia to those by the Cayman Islands, Mozambique and Saudi Arabia -- and those are just the beginning. Spinner dolphins tend to gravitate to areas just off of atolls and islands. Although they look for food such as squid and fish in the nighttime, they unwind in the day hours, usually in lagoons and sizable inlets that are quiet and still, with waters that aren't too deep. When it comes to searching for food, however, they tend to opt for increased water depth. One key adaptation that spinner dolphins have involves their body coloration, and is referred to as "countershading." The undersides of their physiques are pale, and their upper bodies are much deeper in color. Both of these things help keep spinner dolphins barely visible to predators, as they enable them to mix in with their surroundings seamlessly. From above, they appear darker to predators outside of the water, which assists them in staying inconspicuous amidst the blue surface. From below, they look light, and also are hard to spot against the vivid luminosity streaming in from the top. 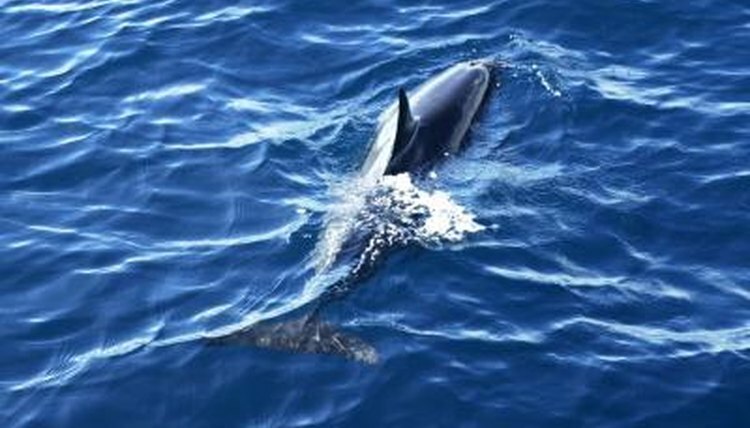 Echolocation is another handy adaptation that spinner dolphins, along with numerous other cetaceans, frequently employ. Through this adaptation, spinner dolphins can easily find things in particularly murky or indistinct waters. These dolphins transmit snapping sounds that travel out via their foreheads. These sonic waves go into the water and spring off of any items that the dolphins might be exploring. The waves then promptly throw themselves back to their cetacean senders. This process allows spinner dolphins to make out everything from the form to the bulk of a certain thing in the water -- whether buddies or desired prey animals.